Pasadena’s “El Molino/Colorado Blvd.” Theater District has, for years, been one of our favorite southern California destinations, featuring such venues as the Pasadena Playhouse, Laemmle’s Playhouse 7 movie theater and a great bookstore. However, with the Pasadena Playhouse in Chapter 11 bankruptcy and that we can now see great films locally at downtown Lancaster’s Laemmele Boulevard Theater, could we find ourselves with no reason to go back? Of course not. The Pasadena Playhouse has re-structured its debt and is presenting their first full season in two years, restaurants like El Portal and Elements are still striving, Vroman’s Bookstore is continuously presenting authors and lectures and the new Monopole Wine at 21 South El Molino Avenue brings a whole new dynamic to the district. We have walked by Monopole numerous times simplistically wondering how a retail wine shop could compete with wholesale and on-line establishments. They seem to be doing well, but surely co-owners Peter Nelson and Hiro Tamaki have determined a strategy to set them apart. It was time to discover just what that was and if it could make us steady customers. Monopole (mon-uh-pohl), a French word meaning monopoly or, in wine terminology, sole vineyard ownership, was created to feature premium European wines and to educate through tastings and other fun events, an inviting business plan for someone who loves Pasadena and is ready to expand his knowledge beyond California and Pacific Northwest varietals. Away from vast California vintages, it’s difficult to research value between the countless fine, century old wines from France, Spain, Italy and Germany. Within a short time in the store, Peter directed me to good value and some unique norms of overseas wines. Complimenting him on his selection of late 20th and early 21st Century vintages, Peter explained that they were all 2011 releases, cellared for nearly a decade before exposure to a consuming public. California wineries may suggest further cellaring, but the release or “payday” usually happens within 24-36 months after grape harvest. Another distinction of European wines comes from the label on the bottle. While the prominent feature of a California label describes the varietal (usually a single grape), then the winery, region, vintage and, on occasion, a single vineyard, labels from France and surrounding countries tell a different story. The most important and recognizable feature is the identification of the appellation or growing area. In most cases, the grapes and percentages used are regulated by the Appellation d’Origine Controlee’ (AOC) and need not be identified. The next significant feature is the name of the individual winemaker or family that produces the wine, followed by the vineyard designation and finally, the bottler that may or may not be the same as the producer. In rare cases, the varietals may be listed but typically identification of the appellation reveals that information. Now, we have begun to understand European wines. On this occasion, we taste a flight of wines from the Languedoc region, often disregarded as a stepchild to the mighty Southern Rhone wines from the Chateaunef-du-Pape, Vacqueyras and Gigondas appellations. In April, we found that the city of Avignon, located due north of Provence, due south of the Rhone Valley and northwest of Languedoc-Roussillon, was ideal base for exploring southern France’s wine regions. Although they all use basically the same varietals to produce their wines, Languedoc uses its “step-child” status to offer better value than the other, more famous appellations. 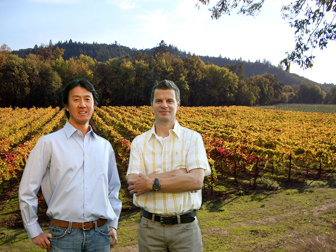 Today, we would learn more about the region and what Peter and Hiro consider good values. First in a flight of good quality, moderately priced wines is the Chateau de la Liquiere Les Armandiers Faugeres Languedoc 2009 ($17), a blend of carignane, syrah, grenache and mourvedre that expresses texture and flavor found in blends with price points in the $25-35 range. The nice bouquet foreshadowed soft, integrated flavors, accessible for most palates seeking a young blend requiring little to no analysis. Unique to many wines from this region, red currant essence adds a subtle new dimension to the more traditional berry flavors of “straw” and “rasp”. However, the key here is that none are overbearing, sending a subliminal message that it wants to be your friend. Our second wine, a Domaine La Tour Penedesses “Montagne Noir” 2008 ($21) from the mountains in Faugeres in the Languedoc-Roussillon region offered a sweet, candied nose and nice bold flavors, although a bit tannic. If you like fruit-forward wines at a moderate price, this would be a one to try. Mourvedre is an old, very famous grape known for playing a major support role to grenache and syrah in crafting those great southern Rhone blends. Here, with the Domaine Tempier Bandol Rouge 2008 ($39), arguably the best wine from Provence, Mourvedre is featured with support from Grenache, cinsault and carignan. The result is rich, concentrated flavors of juicy dark plums and ripening currants with some oaky, smokey on the finish. This wine presents a unique flavor profile, different, one to remember more clearly while sharing my new bottle that lies in wait. A very nice surprise and learned moment came with an offer to try a 2009 Domaine Cheysson Chiroubles Beaujolais ($20), recently awarded 91 pts from Robert Parker, produced exclusively from gamay grapes in the Chiroubles appellation of the Beaujolais region of France. Apparently, 2009 was a great year for Beaujolais and this particular wine can be simply categorized as soft and ripe. More specifically defined, the complexity of ripened tart fruit, combined with soft raspberry finishing with significant smokey, woodsy hints would be appropriate. At $20, this package is what we call a value. Our tasting was part of the “Mad Music Thursdays” event that occurs each Thursday on El Molino between Green St. and Colorado Blvd. and within participating businesses like Monopole. It generally features gourmet food trucks and special music presented by local businesses like Zona Rosa coffee and Elements restaurant. This evening a cellist accompanied and joined our tasting. 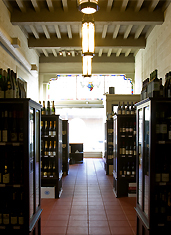 The event is now on hiatus until summer 2012, but special wine tastings, wine dinners and other “educational” events will continue at the wine shop. Those wishing to be informed of future events can register at info@monopolewine.com. As it turns out, Monopole is a tremendous resource to increase one’s knowledge of wines from Bordeaux, Tuscany, Rioja, Rhone Valley and other great region of Europe. One may find themselves in a captivating discussion and leave with that special new “find” from the old country. One such discovery occurred when our friends were searching for a good Spanish wine to pair with tapas at Three Drunken Goats in Montrose. Peter led them a 1998 Bodegas Riojanas Vina Albina Gran Reserva Rioja ($40) from the famous region between Barcelona and Bilbao, recently boasting a 92 pt rating from Stephen Tanzer. Surprised to find such an early vintage available, we learned it was a new release, aged over a decade. It has all the complexity of an aged wine; beautifully layered flavors, great balance and texture. Predominantly tempranillo, the wine delivers assorted hints of flavors from cherry to rhubarb and cedar; a perfect food wine. My passion for California pinot noir is no secret. Hopefully, Peter and Hiro can help me understand it roots through the fine wines of Burgundy, a comparison of interest for sometime. As I was about to leave, a young man came in with admittedly no knowledge of wine and asked for a recommendation, presumably for a potentially special dinner. After some discussion of a probable menu, he was led to the relatively small California section and I overheard Peter asking him if he had seem the movie, “Sideways.” He most likely hooked him up with a nice pinot noir from the Santa Rita Hills that could change his life forever. In its simplest form, wine is still about passion; the kind of passion that created Monopole. Wholesale outlets and wine warehouses have their place. Fortunately, shops like this still exist for those of us who remember the value of personalized service from a neighborhood store. In this case, “professional service” includes impressive expertise, all within a district that continuously fuels the senses. This entry was posted on Friday, November 25th, 2011 at 5:17 am	and posted in Monopole Wine, Wine. You can follow any responses to this entry through the RSS 2.0 feed. These are great posts. It sure makes me want to move back to Pasadena. If it is any comfort, the Pasadena Playhouse has gone through bankruptcy before. It still keeps coming back.